The University of New Brunswick's Fredericton campus has launched a one-year Master in Quantitative Investment Management program.Students are on campus this week for orientation events and are participating in a boot camp to prepare for their classes that will start next week. The program is designed to give students the tools necessary to work in the ever-changing environment of quantitative finance, in particular the buy-side of the industry with a focus on investment management. "Our university is a leader in innovation," says Dr. Eddy Campbell, president and vice-chancellor of UNB. "We work to sense the needs of our region and the world, and respond accordingly. Right now, there's a need for experts in quantitative finance. Responding to that need, we have delivered a high-quality program." The course combines aspects of economics, data analysis, mathematics, finance and coding into one comprehensive curriculum to teach students how to make investment decisions using analytic and programming skills. "This program is directed towards a very niche market, but a market that is growing rapidly and needs to be filled," says Dr. Dev Mitra, dean of the faculty of business administration. "There is a big demand for the skill sets that come with the knowledge of quantitative finance and they are becoming necessary in this industry." Graduates will be qualified to work for pension funds, hedge funds, investing consulting firms, investment and commercial banks, insurance companies, and regulatory agencies, as well as any company that hires data analysts. A strong link with the industry is built into the foundation of this program to give students a direct opportunity to interact with potential employers. The program has a capstone course that gives students the option to work with a company in the industry on either an internship or an applied research project. This program was designed and developed with the help of partnerships with Vestcor and TMX Group. "We look forward to being able to consider the future graduates of the UNB MQIM program for our growing investment and risk management needs," says John Sinclair, president and CEO of Vestcor. "Completing this program will present a unique opportunity to develop the skills to get the high paying jobs that the investment industry provides," says Dr. Mitra. 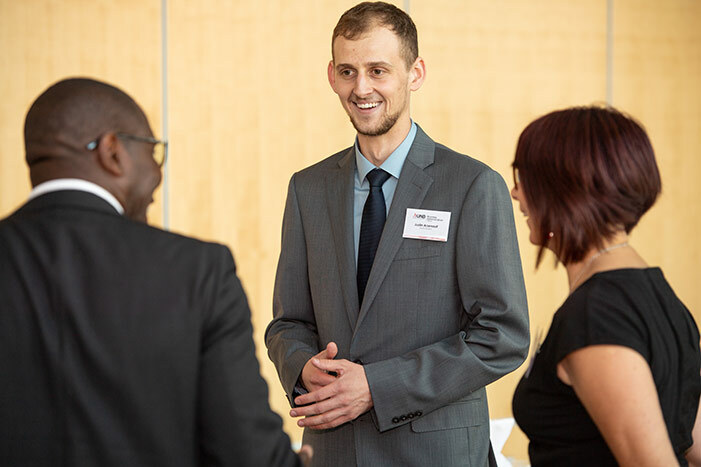 Photo: MQIM student Justin Arsenault at program's launch celebration on Aug. 27, 2018. Credit: Cameron Fitch/Photo UNB.